Corpolimo Express limousine and car service offering wide variety of services including airport transfers, shuttles services, pick up and drop off, nights on the town, tours in Niagara falls, tourist attractions, casino trips, night out, limo for Prom, sightseeing tours, Sporting Events and border cross. Our limousines are well equipped with internet facility, workstations, play stations, telephone facility, TV, mini bar and all entertainment and business needs. 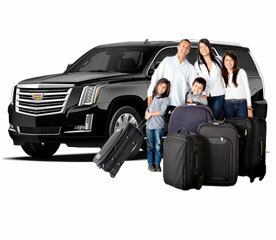 Corpolimo Express is one of the most convenient, reputed and reliable limousine providers in Newark City. For flight delays or any other inconveniences, our highly experienced staff monitors your flight status and keeps updating you. We pick and drop you to and from all airports in New York City. Whether is Newark Liberty International Airport or LGA - LaGuardia Airport, New York or PHL – Philadelphia Airport, Philadelphia or JFK - John F. Kennedy International Airport, New York we have a wide range of limousines, shuttles, and taxis. Booking a Limo is very easy and at your fingertips please visits our reservation page and makes a reservation or request a quick quote. Help us to serve you better, please make your car or limo reservation at least 12 hours in advance.